in a recession than during a boom. They are just about the cheapest form of entertainment there is. 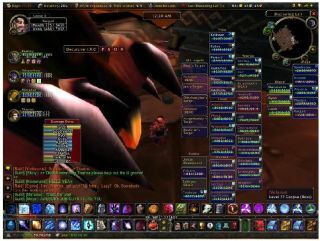 For £7.69, I play World of Warcraft for at least 100 hours a month. That's less than 8p an hour. I literally cannot think of anything else even remotely enjoyable that I can do for that kind of money. It's cheaper than telly*, it's cheaper than reading a book** - heck I probably wear more than 8p/hour of leather from my shoes if I go for a walk***. Even if you don't already have a computer, it would still be cheaper to buy a brand new 20-inch iMac, a broadband connection and a World of Warcraft account if it kept you home from the pub****. You can still see your mates, it will just be at Malygos the dragon, rather than the George and Dragon. So playing an MMORPG can actually be cheaper than not playing one. The challenge then is simply to find one that you can bear to play for long enough periods of time and to the exclusion of all else. This, I submit, was always going to be Warhammer's weakness. I don't doubt that it is quite fun to play for a while. But you aren't going to play three, four, five hours a night, six nights a week, fifty weeks a year. The same is true of City of Heroes/Villains, Asheron's Call, Runescape and just about everything else. And as long as you need to find other things to do with the rest of your spare time, these games become just another expense. Warcraft is the only game that saves you money. I imagine that those recently redundant Warhammer developers may be forced to level Warcraft characters to 80 now, just to make ends meet. ** John Grisham novel, £7.99. Time to read, maybe 3 weeks, tops. *** Timberland Plymouth Trails, £75. At 8p/hour, they would need to last for 938 hours. If I walk at 3 miles an hour, that's 2,814 miles. Which is more than the distance between New York and LA and I'm pretty sure that one pair of boots would not last me if I tried to walk coast to coast across the USA. **** iMac + copy of WoW, £738. Broadband + WoW account £20/month. Over a year, that's £978 or an average of £81.50 per month. If you go to the pub three nights a week and spend just £10 each time, that will cost you £130 a month.